Being your own boss is a double edged sword. I’m sure fellow entrepreneurs will join me on this one. It’s awesome dictating and designing your own life, but at at same time you wish you had a boss responsible for making all the tough decisions and telling you what to do, when you’re feeling overwhelmed and clueless. What if I told you you can actually have both? You can have the freedom and independence you need to fulfil your entrepreneurial ambitions, whilst also having the support and guidance of your superior. That superior is you. Well, technically, it’s the ‘higher power’ you. But a part of you nonetheless. An endless source of wisdom, support, love, insight, guidance, inspiration, timeless intelligence, experience, and a perspective that no one else could ever share with you. We’ve all heard of guardian angels, spirit guides, and the power of our intuition, but how many of us subscribe to the notion that our greatest power is ourselves? Humour me for a second. Entertain the idea that there are in fact parallel universes, and in each of these parallel worlds, we are living the whole spectrum of options, as a result of every single choice we have made in our lifetime. Our life experience, is therefore infinite. Energetically we can, and do, experience a wealth of life beyond comprehension. Now, add into this notion, the idea of soul paths, and past lives. If you’ve ever experienced deja vu, you might be familiar with the theory of soul reincarnation; the idea that are souls are reborn into new bodies to live another lifetime, and this cycle is also infinite. So whilst you reside in this lifetime, it is entirely plausible that a future incarnation, and a past incarnation, are simultaneously experiencing life. Imagine the power of being able to tap into all these versions of yourself, the accumulation of which manifests in to what we refer to as your ‘highest power’; your most enlightened ascendant self, in spirit form. Now back to the real world, for a second. Sorry if that came as a bump! But we are here, in this time space reality, currently without all the answers to the questions on ‘Who Wants To Be A Millionaire’. Damn. I’m not a spiritual master. In fact I’ve barely dipped my toe in to the world of spiritual enlightenment. But what I can share, is how I’ve applied my insights to my businesses, and the awe-inspiring effects it has produced. Trusting my intuition at first seemed completely ridiculous. Writing lists of pros and cons, and entering into hours upon hours of research and risk assessments, was obviously the far more sensible choice. Until I ran out of time and patience. I didn’t just learn to trust my intuition, I learned to trust myself, all of my selves, past, present, future, and parallel. Accessing my alternatives became easier as I became more practiced and committed to my meditation rituals. Faster decision making and intuitive thought processes have rapidly increased my productivity levels, and outputs. Plus I now have more time to commit to learning and pursuing my spiritual path, and connection to my higher power. It’s a win win. My discoveries came quite unexpectedly through Kundalini Yoga. A quick Google search will show you the popularity of this practice amongst the very wealthy, successful, and famous. It has absolutely nothing to do with getting your ankles behind your ears (although I’m told this is very spiritually powerful), and everything to do with connecting to your higher power. Through Kundalini, my interest was sparked for the benefits of meditation, numerology, astrology, and the psychic gift. I can’t stand on my elbows, but I can sit on a pillow for 15 minutes and listen to my breath. I openly and expectantly ask for signs from my guides and ‘alternatives’, and draw comfort and inspiration from the manifestation of 11:11, multiple 2’s, and horses (my spirit energy). Synchronicity has replaced coincidences; reframes have replaced set backs; curiosity emerges in place of frustration; humour in place of despair; self-reflection disturbs anxiety; and love out shines fear. My belief in the power of the universe has been supercharged by my connection to my higher self. It has also supercharged my mothers belief that I’ve officially and completely lost the plot. Daily meditation has proved transformational for my business, in ways I can’t really explain. Initially it felt like a waste of time. Do you know how much can be achieved in 15 minutes?! Of course you do. The real power came when I could slip into meditation to ask for specific guidance. When faced with business conundrums, conflicts, and challenges, I can now go to my pillow for almost immediate answers and solutions. Pretty cool huh? The commitment to my spiritual self has offered me immeasurable reward and a return on my investment. Through meditation came conversation with my alternative selfs. Almost like picking up the phone to my past, future, and parallel selfs, to ask what they would do, and how they would deal with whichever scenario I was faced with at the time. It’s interesting to hear so many different perspectives come from me. I’m not as narrow minded as I once thought. Certainly beats the bias of searching for answers from family, friends, coaches, peers, and the world wide web. We already have all the answers we need inside of us. We just have to tune in to listen. The answers don’t come in a string of words in the way we are used to receiving instructions. It’s more a feeling of just knowing, and having a really calming sense of security around your decision. 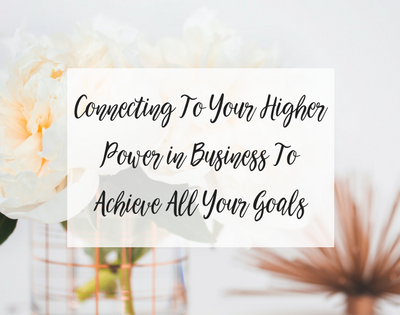 Beyond Kundalini Yoga, meditation, and talking to myself (even I’m questioning my sanity at this point), there is an awareness of emotion which has proved an incredibly useful tool to steer my business in the direction of my goals. Learning to act with love and positive intention, holding an awareness of self in the face of potentially damaging situations, and choosing to NOT react, is akin to bringing Oprah into your office space. Rising above any undesirable scenario is a fast track to connecting to your higher power. They don’t call it ‘rising above’ for nothing. You suddenly become the yogi master of your own spiritual empire. In raising your own vibration, you impact your clients, employees, suppliers, and every one you interact with in a really positive way. It’s impossible to NOT get your own way, even when navigating the most difficult and awkward waters. Business begins to flow. In an effortless, inspiring, and joyful way. Even the unexpected bear beautiful results, because you hold everything in a positive light. There are no negatives when you can control your own emotions. To some this ‘advice’ might seem far too wishy washy. There is no step by step to connecting to higher power. It’s not as logical as writing a to do list, or going through the motions of setting up a digital marketing funnel. It is unfamiliar, but that’s the point. In choosing to enter into the unknown, I’ve awoken within me the most powerful tool I could ever gift to my business. Now, of course, the cynics amongst us will cry “placebo effect”, but so what? If it’s really all in my imagination, then the power is my imagination, and not what I call my ‘higher power’. Either way the answers, the power, the inspiration, and the positive vibration come from within. If I’ve created an environment in which negativity can’t grow, then I’ve done my fair bit to contribute to a better world. I’m holding a positive space for everyone I connect with to become the best versions of themselves, and perhaps even connect with their own power. Holding a positive space means I have a highly driven and happy staff team, clients who just keep coming back for more, suppliers who can’t do enough to help me, and an income which makes me a very happy bunny indeed, even without the ability to master the bunny pose. I jest. I don’t even know if there’s such a thing as a bunny pose. The point is, you don’t have to be a throat-singing monk, or a super bendy vegan, to enter into your spiritual journey to connect to your higher power. Just sit on a pillow and listen to yourself. It’s how I got started anyway!